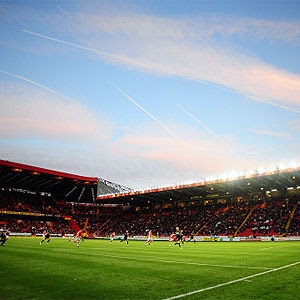 Charlton will be hoping to maintain the recent positive momentum in tonight’s fixture versus Bristol Rovers at The Valley; a thumping of MK Dons in the last home match was replicated in effort if not the result on Saturday in Somerset, where, but for Sam Sodje’s sending off, three points would surely have been won. Phil Parkinson will need to make at least one change to his side, due to Sodje’s sending off, but may make others after the exertions on the soggy Yeovil pitch, while a man short, which could have left some struggling for fitness. Carl Ikeme did what he needed to on Saturday in goal, making one decent first half save, kicked like a mule (only to see the ball travel short distances) and then watched the second half from afar as the wind kept the ball away from him for prolonged periods. He is sure to retain his place, with Darren Randolph on the bench as understudy. The mini-experiment of playing Kelly Youga at right back worked reasonably well on Saturday; Youga’s defending was as good as ever, and he did get forward at every opportunity – especially in the second half when a man down – but his inclination to dribble on that pitch wasn’t suited and the fact that he wanted to bring the ball onto his left foot in order to cross seemed to slow things down a little. On a better pitch, the ability to cut inside may suit Youga, so I would persevere with him at right back tonight. The only option is to play Elliot Omozusi from the start, but I believe that Grant Basey on the left offers a better all round option than Omozusi, so would keep him on the opposite side to Youga. Basey had a good game at Yeovil, defending well, and offering surging runs forward in the second half when Charlton attacked at will. Basey also possesses a great left peg and his corner taking was good, and importantly he learnt from each kick and ended up hitting the bar courtesy of the wind. Christian Dailly used his experience to the full effect in Somerset and, up against young Spurs guns on loan, he did well. Miguel Llera also played well after coming on once Sodje was sent off, and Llera should keep his place while Sodje serves his suspension tonight. 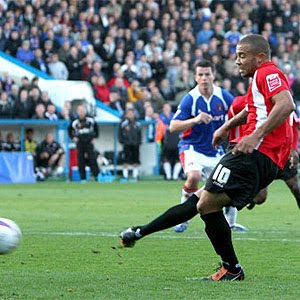 Llera also has a sweet left foot, and he is a dangerous option from free kicks, when Nicky Bailey allows him to shoot that is! Providing Bailey is fit, I expect the midfield to be unchanged this evening, with Jose Semedo anchoring the three creative players that are Bailey, Therry Racon, and Lloyd Sam. Racon was sacrificed at half-time as Parky sent on an extra forward on Saturday, so he should be fit enough to run on a pitch that he doesn’t get bogged down on. Bailey got his usual whack that went unpunished by the referee in that game, but hopefully it’s just another bruise on top of his other bruises. Sam has showed glimpses of a return to form recently, and he put in an excellent second half showing in Somerset, so a continuation of that would be good. If anyone is unfit, Matt Spring and Scott Wagstaff will be ready to jump at the chance of a starting slot. Parky’s biggest decision is going to be who plays up front; Leon McKenzie, Akpo Sodje, Deon Burton, and Dave Mooney have all scored inside the last three games, but only two can start tonight. Add to that the fact that Izale MacLeod has now served his three-game ban, and Tamer Tuna scored a hat-trick for the youth team last week and Parky has plenty off options. With still no news of Burton having his hernia operation, and the fact that Parky has said it takes him a few days to recover from a game due to this problem, I think Burton may be rested tonight, and he may well have now gone under the knife with no game to come on Saturday. 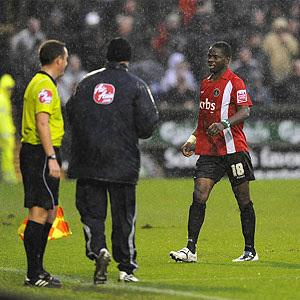 That would leave Akpo Sodje to carry on where he left off on Saturday, and also bring Dave Mooney back (after he was sacrificed for Llera after Sam Sodje’s sending off). McKenzie didn’t make the subs bench on Saturday, rather surprisingly, so I hope he isn’t injured again, but if he is, and Burton has had his op, then McLeod could make a quick return to the squad but not the starting eleven. Subs from Randolph, Omozusi, Mambo, Jenkinson, Spring, Stavrinou, Wagstaff, Burton, McKenzie, McLeod, Tuna. Our opponents, Bristol Rovers are having an up-and-down season. They started well and sat just behind us in third place in the table back in September, but have since slipped down again (losing all five league games in October), before returning to positive results over recent weeks with two homes wins. They have a goalkeeper on loan from Reading – as Yeovil did on Saturday! – and also our own Chris Dickson, though he isn’t allowed to play. The dangerman is the diminutive Jo Kuffour, who has six goals so far this season. They will be hoping to win again, but will settle for a point if offered I’m sure. One thing is obvious from their results - they concede goals (not having a clean sheet since mid-September), so the Addicks strikers could profit tonight? Pedro45 has to be confident going into tonights game, based on the last two games, and predicts a 3-1 victory. With the power and goalscoring threat up front we now have coupled with a strength in midfield, and some (only some) fresh legs, we could have too much for Rovers to handle once more, provided we can keep eleven players on the park. My one-to-watch tonight is going to be Dave Mooney. Our Reading striker will be one of the fresh ones, after playing just half an hour on Saturday. He broke his Charlton duck in the last home game with a crisp finish, and has got better as his fitness improved over recent weeks. With possibly a new partner to start with tonight (if Burton is not played from the start), I can see him forging a potent attacking force with Akpo Sodje that may be to hot to handle – I hope so! With Rovers porous defence, and Charlton finding their goal-range recently, we could see a few hitting the back of the net tonight. We mustn’t be over-confident, but we should win games like this at The Valley. 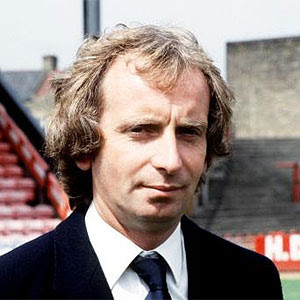 I will leave with a thought for the man pictured at the top and returning to SE7 this evening; a man who led the club through all the dark days of the 1980’s – Lennie Lawrence. What Lennie did for Charlton should never be forgotten, even if his autobiography is (or has); the man is a star and should get a standing ovation as he arrives for his kind are few and far between. We may have had Kinsella, Parker, Di Canio, Bent, Rufus, Brown, and Robinson in recent times, but without Lennie, there may well have been no Charlton, and none of those players playing for the Addicks. Give it up for Lennie! Just a short note for any Charlton fans (or anyone) driving down to Yeovil tomorrow; you may be horrified to see signs telling you that the A303 is closed (at Mere) but don’t worry, this is only for midweek night-time roadworks and is clear during the day and at weekends. Provided nobody hits the car in front (as two drivers did today – one in each direction between Stonehenge and Chicklade) and cause tailbacks, you should have decent run down and get to Yeovil about two hours (or two and a half if you keep your speed!) from joining the M25. After such a resounding win last weekend in the first ever game against MK Dons, Charlton hope to keep on winning with a visit to Yeovil for the first time in their league history. The Glovers are a nice team, and one that many look out for results due to their famous FA Cup exploits in years gone by. Now they are a league team, and have done very well since joining the league a few years back. Yeovil are actually my wife’s parents nearest league club, though my in-laws love remains with other League One rivals Norwich. Phil Parkinson will want to keep the momentum going, trying to create a gap between the Addicks in second place, and the chasing pack, which includes the Norfolk team, amongst others. Last weeks worry that a defeat would see Charlton drop a couple of places may have spurred the team on, and a loss this week could also see Charlton out of the top two for the first time this season. That will not be an option, hopefully, as Charlton do look like they may have too much for the Huish team. Even without the injured Rob Elliot, Carl Ikeme and Darren Randolph are decent goalkeepers, although both have different attributes. Ikeme is much taller but for some reason looks vulnerable under the high ball, while Randolph is a great shot-stopper. Parky seems to be favouring the on-loan player, so I expect to see him in between the sticks once more, with Randolph on the bench. Frazer Richardson tweaked his hamstring again last week, so he’s definitely out of this match; that leaves a straight choice between Elliot Omozusi and Grant Basey to replace him. If Basey, a second half sub for Richardson last week, comes in, then Kelly Youga will switch effortlessly across to the right back slot. For continuity, I would pick Basey, with Omozusi on the bench as cover. Sam Sodje will look to continue his great form of late, and Christian Dailly will be along side him, completing the back four. In midfield, last week’s "experiment" of moving Nicky Bailey back inside from the wing was a resounding success, so the central four of Jose Semedo, Bailey, Lloyd Sam and Therry Racon is likely to be unchanged. In attack, a lot depends on whether Deon Burton has had his hernia operation yet; I was certainly hoping he had by now so that his three week recuperation covered the vacant cup weekend next Saturday and he was fit by the time that Dave Mooney goes back to Reading (if he does), but no news of this has leaked out so it may not have happened. Akpo Sodje is a ready made replacement for Burton when he does go under the knife, but Mooney will definitely play after opening his scoring for the club last Saturday. Subs from Randolph, Omozusi, Llera, Spring, Stavrinou, Wagstaff, Holden, McKenzie, Tuna, Sodje A.
Yeovil themselves are on a nice roll at present, with just one defeat in their last eight games; their home record is average, and they have yet to play any of the major sides in this division at Huish yet, so Charlton must fancy their chances. Yeovil’s squad is bolstered by three Spurs youngsters who are all on loan, with striker Okobi the pick of the bunch. Ex-Ipswich youngster Dean Bowditch has just come back from injury and will also be a threat. Pedro45 is confident that the 1500 travelling fans will have good reason to sing with their cider tomorrow, and is predicting a 2-0 victory. Yeovil will huff and puff but, in the weather we are having, should get blown down by Charlton’s better skill, greater experience, and solid teamwork. My one-to-watch in this game is going to be Lloyd Sam. Lloyd looked like he was getting back near his best last week and it’s about time too. He has so much to offer but sometimes cannot translate that into match winning opportunities due to lack of decent ball, double-marking, or apparent lack of desire. When on form, he is simply a match-winner in this league, and I’m hoping that we see him taking on and beating people as we know he is very capable of. He really should be scoring plenty of goals at this level too, and last weeks clinical strike was an indication of how good and dangerous he can be. I’m looking forward to a new ground to visit tomorrow and another Addicks win; last weeks 5-1 win must not be a flash in the pan and Parky needs to get the team in the same frame of mind once more. We should be beating teams like Yeovil, so let’s just get the job done and move on to Tuesday’s match. For all the doom merchants out there, especially those who have gone very quiet since Saturdays thumping of MK Dons, Charlton currently have a better than 50% chance of being automatically promoted come next May. It’s gets better though, for if Charlton maintain their points per game ratio (which is currently 0.667 per game) over the rest of the season and finish with 92 points, the odds on promotion are 99.5%! Anything above 96 points, and we are 100 per cent certain to go up! In fact, only with a 50% points ratio over the final 30 matches (45 points from 12 wins, nine draws, and nine losses) will see any possibility of the Addicks falling out of the play-off places, and even then the likelihood is we will finish inside the top five. For Charlton to have a realistic chance of falling out of the play-off places, we would need to finish with under 71 points, so we are almost half-way there. And for the really negative fans, the chances of us getting relegated only start if we lose about 16 of the remaining 30 games. Surely not many of you think it can get that bad? Of course, being Charlton anything could happen, and probably will, so maybe that remaining 12% chance of winning the league should be backed? There, that’s made you feel better hasn’t it! Four away games, only a draw to show, and a lucky one at that – not the best form from the Addicks recently then…but now we are back at The Valley, and hopefully, hopefully, things will change. Charlton will play their first ever game against MK Dons on Saturday, and if things had turned out differently, it could have been an MK Athletic team playing Wimbledon: Way back in the early seventies, it was rumoured that Charlton were looking to up sticks and move to the new town with concrete cows and lots of roundabouts themselves; luckily for us, it never happened. Wimbledon themselves followed Charlton into ground-sharing, and sadly for south London, they found it as unbearable as we did but left for pastures new instead of returning home. It is a moot point if the team now billed as MK Dons are in fact Wimbledon, or if that moniker still belongs with AFC Wimbledon, a team just two divisions below having worked their way upwards consistently over the last fifteen years or so. Whatever they are called, they are the next team we have to try to beat, so let’s move on. Out of the cups, but still second in the league doesn’t look like a gloomy situation, but if you said we were out of the cups and 18th in the table (as we are form-wise) then not many would be happy. Charlton really do need to start to win again, and a victory against the team in third-place in the table would be a welcome boost. At least manager Phil Parkinson has a pretty full squad to choose from, but this in itself will cause him headaches I’m sure as he looks for that winning combination. His first problem is who to play in goal, with Rob Elliot still some weeks short of fitness. On-loan Carl Ikeme got the nod at Carlisle, saved a penalty but was beaten by a couple of long range thunderbolts; then Darren Randolph played in the FA Cup reverse at Northwich, made a couple of outstanding saves, but hesitated on the goal that separated the teams; Ikeme returned at Southampton but had a 40% success rate on crosses (one which he should have come for resulting in a goal) and let the second goal slip under his hand. A tough call this, but I hope that Parky reverts back to Randolph and gives him the opportunity for a run of games that he has craved for over the last few years. At right back, we now know that we can rely on Kelly Youga to switch and do a good job if necessary, but the choice is likely to be between Frazer Richardson, who could be fit, and on-loan Elliot Omozusi; I do think if Richardson is fit he will play, and if Grant Basey is included as a substitute, then we have cover (with Youga switching) if Richardson cannot last the full match. If Richardson has to miss out again, then Omozusi will play. Sam Sodje is available having turned down a chance to play (or more likely travel but be left out of the match day squad) for Nigeria so I expect him to start at The Valley, with Miguel Llera making the bench against his former club. The rest of the team really depends on how Parky views the last couple of weeks, but I do suspect that Nicky Bailey and Therry Racon will return after their midweek rests, with Jose Semedo and Lloyd Sam also starting. Then we get to the million dollar question – do we start Jonjo Shelvey and play 4-5-1 or play with two attackers? I suspect that such is Shelvey’s form at present that he may well be left out once more, and we see Dave Mooney (who ran his heart out and put in a very good 90 minutes on Wednesday) and Deon Burton play from the beginning. With Leon McKenzie and Shelvey, plus maybe Tamer Tuna on the bench, we have options when either of these get tired or we need to bolster or reduce our forward line. Izale McLeod is of course banned for three games as a result of his elbow use last week, so the dilemma of whether to play him or not disappears. Subs from Ikeme, Basey, Omuzusi, Llera, Stavrinou, Spring, Wagstaff, Holden, Tuna, McKenzie, Shelvey. MK Dons have Jermaine Easter, scorer of the Wycombe goal that knocked Charlton out of the league cup quarter final four years ago, missing due to his involvement with Wales, and could also be without other key players due to injury. One time Charlton triallist Darren Powell could start in defence, and Charlton summer target Jason Puncheon is the obvious threat from the wing. Hopefully, having tried to sign him, Parky knows all about how he plays and how to counter him. Pedro45 really hopes that Charlton have hit a low point, and can start to get back to playing some of their better football from now on. The confidence that the side exuded early in the season seems to have disappeared, and maybe some of that came from missed chances (by McLeod?) or mistakes at the back (by Omozusi and Ikeme? ); by leaving out those three players and committing to Charlton registered players (bar Mooney), the team should be committed once more and work together. I think this may take time though, and against a good side, the best we can hope for is my prediction of a 1-1 draw. My one-to-watch this week is going to be Nicky Bailey (left). Our skipper has had a bit of a torrid time recently and hasn’t scored for a while, so he is due. It is difficult for him to be playing out on the left wing, but he showed that he is more than capable during the early part of the season when he was taking on and beating full backs at will. 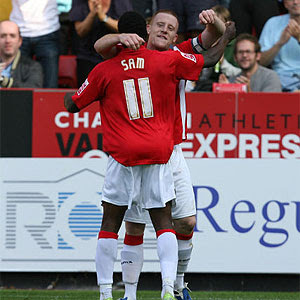 When Sam had the ball, Bailey’s runs into the box to support Burton also had much goal-threat. Bailey needs to roll his sleeves up and find his form, and soon. It has been all doom and gloom over the last few weeks, but the sun does always rise, and maybe it is Charlton’s turn to rise out of the November haze? The team need our support at this tough time, and they will get it if they show determination, team work, and skill; with that, we can get a positive result and hang on in there near the top of this league. Well, that’s any dreams fans may have had of a trip to Wembley over for another season. A 2-1 score-line that may paper over some cracks, but for an hour, Charlton were abysmal yet again. Phil Parkinson made plenty of changes, recalling on-loan Carl Ikeme in favour of Darren Randolph, switching Kelly Youga to right back to accommodate Grant Basey, resting Sam Sodje and Therry Racon in favour of Miguel Llera and Matt Spring, playing two wingers (Scott Wagstaff and Lloyd Sam), and finally starting with Dave Mooney alone up front. The home team should have taken the lead in the first minute, when a free header went wide after Ikeme completely missed a corner. Southampton then put much pressure on Charlton and it was a good twenty minutes before the Addicks settled into the game. By then, Ikeme had fumbled another cross, and also let a shot slip under him that luckily hit the post and bounced out. The defence, marshalled by Christian Dailly, were so so busy again, with Jose Semedo having one of his worst games in a Charlton shirt and completely failing to protect the back four as the Saints surged forward. When Charlton did settle, Wagstaff had a shot blocked, but that was about it until the first goal; a corner was missed by a couple of players and Youga stood still as Thomas walked past him to tap into the net. Ikeme may have done better if he had tried to claim this ball, but maybe he would have dropped that one too? Having just about made it to half-time one goal down, it was once more left to Parky to read the riot act, and at least there was a marked improvement early in the second half. Mooney started to find balls played up to him rather than over his head, and Sam and Wagstaff out wide had help as Youga and Basey pushed on. Spring had a shot go wide, but then Parky chose to switch things around a bit, bringing on Luke Holden for his debut in place of Sam. Almost immediately, the lead was increased as Lambert’s snap shot flew under Ikeme’s outstretched hand and, without the luck of the post this time, another poor defensive goal. This led to a complete change of tactics as forwards Leon McKenzie and Deon Burton entered the fray, with Wagstaff and Semedo trooping off. Holden switched to the right to accommodate McKenzie, but this really didn’t look like it helped him as he continually lost the ball when trying to bring it back on his left foot. The game was drifting to a wet and forgone conclusion when Youga got lucky with an offside flag, played the ball back to Holden who had time to hit a sweet left foot cross which McKenzie turned home from six yards - his first goal for the Addicks. Sadly, there were just two of the three minutes injury time left and Charlton could not mount another attack in the time left. This has been a disastrous week for Charlton, culminating in three consecutive losses and crashing out of two cup competitions. The management have tried to switch things around, play the whole squad, and try out different tactics, but it has all looked so disjointed, and the team do not seem to believe any more. Saturday’s home game is a chance to bounce back in the league, and it is a chance that they have to take if the wrath of Addicks fans is not to befall the squad and hierarchy. The FA Cup loss to Northwich Victoria has left a bad taste in many Charlton fans mouths and, hopefully, that foulness can be taken away with a bounce back win tonight in the Johnstone’s Paint Trophy. Charlton visit Southampton with it all to prove. It is highly unlikely that the same eleven players who performed so poorly on Sunday will start the game, but many will, due to the rules of this competition. I just hope that they realise that anything less than 100% is not acceptable if they wish to continue wearing a Charlton shirt. Phil Parkinson, as any manager should, rightly shouldered the blame for the defeat to the non-league side, as he picks the players for every match. He will have gone into that game knowing that Charlton had three games in six days, and had already said that he would need to use his full squad. Maybe that accounted for some of the lack-lustre, as players knew that they had other strength sapping matches to come; it was totally wrong if they did. We have three ‘keepers, and Rob Elliot played in the last round; he’s injured now, so as Darren Randolph has been substitute in every game up till Sunday (where he played), and Carl Ikeme has only played once, it has to be Randolph in goal for me. The defence may be shaken up, but unless Kelly Youga is moved to the right back slot, I expect Elliot Omozusi to carry on at right back. I do think that Grant Basey will get a game, so Youga’s action may depend on others availability. I also think that Miguel Llera will play, and that means that one of Sam Sodje and Christian Dailly will be left out, probably our Nigerian. If we play Llera, Dailly, Youga, and Randolph, then we are obliged to only involve two more of the regular players, though I suspect that more may start. Nicky Bailey is almost certain to be one of these, and Jose Semedo will probably also start. I think that Matt Spring will get a game too, so that means playing Bailey out on the left once more. Lloyd Sam looks in need of a rest, so I expect Scott Wagstaff to get another 90 minutes, especially after he did so well in the last round. That leaves two places for strikers, and Parky really has to make the call between 4-4-3 and 4-5-1. After much recent experimentation, he must agree with fans and realise that the only time we can and should play 4-5-1 is when Jonjo Shelvey fills that behind-the-striker role. Tamer Tuna is the only other player to have made a decent go of it, and it took him over 20 minutes to get settled in the Barnet game. For that reason, unless Shelvey is given a start, and he might be, then I would play two up front and hope that the Bailey-Spring-Semedo midfield can cope. Dave Mooney must be chomping on the bit to get a start for the Addicks, having been used solely as a sub since he arrived on loan. I would give him that time tonight, and play either Leon McKenzie or Izale McLeod alongside him. Deon Burton was only a sub on Sunday playing the last half hour, and we know that he struggles to recover from his hernia problem from week to week; I therefore think it doubtful he will play from the start this evening. With Tuna dropping back down to play for the Youth team recently, it looks like Parky is content he has enough other options up front. Subs from Ikeme, Richardson, Youga, Mambo, Stavrinou, Racon, Sam, Burton, Shelvey, Tuna, McKenzie. Picking a Southampton team is just as difficult, but as they have been on a roll of late, I expect them to be extremely tough opponents. They have been fairly free scoring recently and with Rickie Lambert and David Connolly have two forwards who know where the goal is. Pedro45 has been very down over our loss on Sunday and the recent poor form of the team generally. Sadly, I can see no option for an upturn tonight and think that they may have to call the dogs off when it gets nasty – I predict a 4-0 loss, and more angst among fans. My one-to-watch for tonight is going to be Scott Wagstaff (left), scorer of a terrific goal against Barnet in the last round of this competition (top pic). With Sam out of form, we should be seeing more of Waggy on the wing, and tonight may be his chance to shine and put pressure on Sam to put up or shut up. It’s been a bad week for Addicks fans so far, and things may get even worse tonight, unless Charlton can get an unexpected win. That could turn everything around of course, and keep the club on track for Wembley, which is some fans dream. I’m just not of that opinion, but will be happy to see it come true. With Darren Randolph in goal, manager Phil Parkinson chose to start with Jonjo Shelvey and Izale McLeod in attack, and the rest of the side as per expected. The pitch, often a leveller in games such as these, was like a billiard table, but for some strange reason, Charlton always seemed to want that extra touch on the ball, and that allowed Northwich to close them down and disrupt and passing movement. It quickly became apparent that the main thrust of any home attacks would come from either the long throws into the area aiming at the six foot seven inch centre back Bailey, or from corners also aimed in that direction. Sam Sodje, Christian Dailly, Jose Semedo and Kelly Youga all had trouble dealing with the plentiful balls into the box, but did enough to prevent any near misses. When one ball did come to Bailey, his header was saved well by Darren Randolph in goal at the expense of a corner. Charlton had little to show in attack, with Lloyd Sam crowded out, McLeod lonely and with no service, and Shelvey, Nicky Bailey and Therry Racon only visible in defence. Even though the home side kept giving the ball back to Charlton, the Addicks often simply ran the ball out of play when nobody was near to challenge, resulting in another heave into the penalty box and more pressure. One throw led to an almighty goalmouth scramble with five shots being blocked on or around the line before Randolph fell on the ball, Charlton surviving on level terms thanks to Dailly's positioning. Just before half-time, Bailey headed on another long throw and this time a Northwich player was able to connect with a header on target, but Randolph pulled off a tremendous save. You hoped that the half-time talk from Parky might have livened things up a bit, and it was true that their was more fight from Charlton early in the second half, not least from McLeod who’s use of his elbow may yet see him banned for a game or two. The pattern continued, with Charlton conceding throw-ins,, the resultant heave headed up in the air and clear, then being presented back to Northwich for the cycle to start over. Even the substitution of Deon Burton, still yet to have his hernia operation, and Leon McKenzie (for Shelvey and McLeod) did little to change things, though Burton did have a shot blocked. It was left to the home side to break the deadlock, when a punt from the ‘keeper was headed out by Sodje, then headed back past him for the substitute Riley to chased through and poke past the hesitant Randolph. Scott Wagstaff came on as a last throw of the dice, and did give one of the best 10-yard passes by a Charlton player all day (it may also have been the only accurate one? ), but sadly it was in his own half and the home ‘keeper will not have had an easier afternoon. He simply did not have one single shot to save all match, showing how rubbish Charlton were. Credit for Northwich; their fans were great and they celebrated like they should after their famous victory. They now have another home tie against league opposition - Lincoln - and I hope that they win that game too. Where to go from here then? Parky has it all to do now in my opinion; the confidence that was so prevalent at the start of the season seems to have vanished into thin air. Maybe it was the disallowed goals versus Southampton, and/or maybe it was Holt’s injury-time goal at Carrow Road, but since those games, the confidence has slowly leaked like a punctured tyre and is now completely flat. The management now have a midweek cup game of far less importance (but also on TV) to try to turn things around, though that will not be easy. Too many players are not on-form, and the style and tactics seem to have been forgotten. Failure on Wednesday, and in next weekend’s crucial league game could see the tide turn against the man at the helm once more, as fans will refuse to see a repeat of the mistakes of two years ago made when a similar start to the season went wasted by missed opportunities and lack of direction. History was made by Charlton today, but it was not the kind that we wanted. But enough of that; we now have two cup games to play and thoughts of league form can disappear for a week or so. First up on the Cup calendar is Sunday’s FA Cup tie at Northwich Victoria. 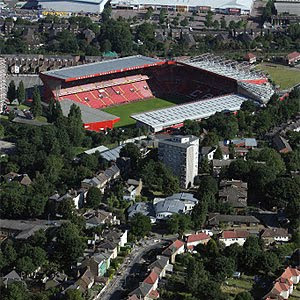 Charlton have, of course, never lost to a non-league club in the FA Cup, so a little bit of history is on the line here. I don’t sit with the suggestion that we should play a weak team in this competition (so we can concentrate on the league) but I fully expect to see at least some changes in the Addicks starting eleven. The line-up is further complicated by the situation with loan players (of which we currently have three) and injuries (of which we also have a few!). Phil Parkinson will have weighed up his options, and the first thing he will have decided, with little alternative, is that Darren Randolph will get his first start of the season in goal. 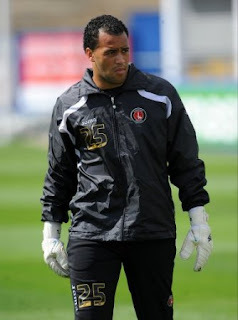 As Rob Elliot is injured, and loanee Carl Ikeme is unable to be cup-tied, Charlton have just two goalies to call upon, and Randolph, even though he has been told he can leave Charlton if not holding down a regular first team place come January, will get the nod over youngster Jack Binks. The second of the new loanees, Elliot Omozusi, should be able to play; his situation is that although his registration is held by Fulham, he has signed a contract at Charlton, so technically it isn’t a loan. Unless Frazer Richardson has recovered from his thigh injury (which I doubt), then Omozusi should start at right back for the second week running. He will also have benefited from an extra weeks training, and hopefully can last the 90 minutes this week. The third loanee is Dave Mooney, here from Reading until the start of December. I do not know if Reading will allow him to play, and it will be a shame if they don’t, because he may well have started this game from the off. It has been well over a month since news of Deon Burton’s hernia problem leaked out, and his performances since then have been full of effort, but little skill. I really hope that the club took the opportunity to get Deon’s operation done earlier this week, so that Mooney can at least begin a few games before Deon return’s from injury. Should Burton be out, and Mooney unable to play, then the attack will focus more on Izale McLeod, who hasn’t had much decent press recently. I think it fair to say that McLeod will never be a favourite with Addicks fans, probably in much the same way that Kevin Lisbie, Kim Grant, and Martin Pringle weren’t. All had pace to burn, but were profligate in front of goal, and to supporters brought up with clinical finishing (by the likes of Derek Hales, Darren Bent, and Clive Mendonca) simply will not accept missed chances. McLeod does at least get into those scoring positions, which is more than some recent Charlton forwards have, and if he scores on a regular basis (about every third game in this league), I am happy to see him start games. The rest of the team will probably be the pick of those that need a game, need confidence, or replace those needing a rest. I doubt that Parky will want to make wholesale changes that might unbalance the side, but he will need to beware the underdog and put enough talent on show to enforce the win. Subs from Binks, Basey, Sodje, Clark, Stavrinou, Racon, Sam, Shelvey, Tuna, McKenzie. I will stand corrected, but I think that you only get five substitutes in FA Cup this season? As an aside, and knowing that our next game is the Johnstone’s paint Trophy cup game at Southampton on Wednesday, I would not be at all surprised to see both Llera and McLeod booked in this game so that their suspensions fall for the JPT game and not any following league game. As for our hosts, Northwich Victoria, they are a club with financial worries and the fact that this game is being shown on TV will be a huge boost to their finances. Sadly, with the game moved to a Sunday lunchtime kick-off, the travelling support from London will be much reduced, with maybe less than five hundred Addicks in attendance. Also missing will be two of the better Vics players – Danks and captain Grand - who are both suspended. Of the rest of the team, striker Newby played well over a hundred games for Bury, full-back Brown played 40 times for Port Vale, and winger Elam has played for many successful Conference teams. 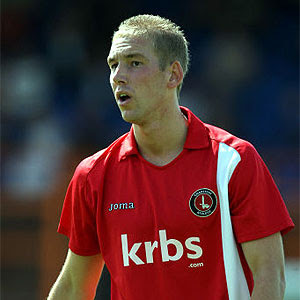 Charlton will also need to beware of Matt Bailey, Northwich’s six foot seven inch defender, at set-pieces. The Northwich supporters really seem to have got excited over this game, and who can blame them! It will provide a welcome financial boost to them, and their rivalry with Witton has had many fans laughing on the Charlton Life forum site. Pedro45 is well aware that cup games can and do provide upsets, but I think that Charlton will have just a little too much, whatever side starts, for the home team to handle. I am predicting a 2-0 victory for the Addicks, and a relatively comfortable game on a good pitch. With two of Vics key players out, McLeod and Llera should have easier games (if they start) and provided that nobody drops any clangers, we should see the Addicks safely through to the second round at 3.15 on Sunday. My one-to-watch in this game has to be the only player that I am confident will start – Darren Randolph. With it likely that he can cement himself into the team for the JPT game too with a good showing, Randolph will be keen not to make any faux-pas like he did on his home debut against Southampton about 18 months ago. Not as big as Elliot (or Ikeme) it will be important for him to take control of his penalty area and deal with crosses coming into the box. If he can do that, and clear his lines quickly, then the shot-stopper should have a good afternoon. I am confident that Charlton's record of never having lost to a non-league team will be maintained on Sunday, and even have a (small) hope that the game is drawn so that Northwich get some additional revenue from a replay. Other than that, we should be simply too strong and have too much skill and desire. Another poor game from Charlton resulting in the second defeat of the season for Phil Parkinson’s side. It always seems to be the way that when a manager gets a new contract, or a loan player signs permanently, that performances dip; Parky extended his managers deal for another year on Friday which gives him security and the club stability, but possibly at the expense of this result. The manager did at least try to earn his corn, having to make two enforced changes after injuries last week to Rob Elliot and Frazer Richardson. Two players arrived on loan as replacements – Carl Ikeme, a goalkeeper from Wolves, and Elliot Owuzusi, a young right-back from Fulham – and both made reasonable debuts at Brunton Park. Charlton made a slow-ish start, as they seem to do in most games these days, while Carlisle merely sat back and waited to see if Charlton were as good as they had been built up to be and that their lofty league position suggested. Eventually, the game burst into life in a mad five minute spell just before half-time. First, Christian Dailly was beaten for pace and fouled Dobie, earning himself a yellow card that could easily have been red. Ex-Charlton triallist Harte then crashed the resulting free-kick against the post, with Ikeme beaten. The ball was cleared for a corner, and when that came in, Sam Sodje appeared to be climbing all over a Carlisle player in an attempt to get to the ball. Penalty appeals were waved away as the ball went out for another corner, but when this came swinging over, a mere nudge by Deon Burton warranted a spot-kick award according to the inept referee. 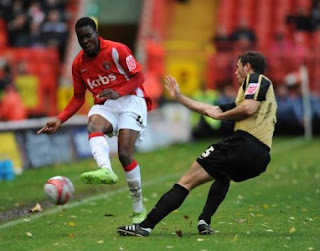 This was the first penalty - either for or against - in a Charlton match this season. Ikeme (or Carly Keyma as the radio commentator seemed to like calling him) guessed right and dived left to save Harte’s penalty but, unfortunately for him and the 550 Addicks supporters who had made the trip, Harte was on hand to scramble home the rebound. The manager, Parkinson, was then sent to the stands for complaining about the initial decision, and having viewed it and the previous claim, you have to say that two wrongs (for that is what they were…) do not make a right! Almost immediately, Charlton bounced back when a passing move led to Burton bursting into the Carlisle penalty area and he was tripped; Charlton therefore had their own first penalty of the season. Like buses, when you wait ages for one, two come along together! Burton confidently despatched the kick and Charlton made it to half-time on level terms. It was Burton’s 100th league goal, and one he has been seeking for quite some time. The game was really calling out for Charlton to take control, but for some reason (which I am sure Parky will look deeply into) possession was easily relinquished on numerous occasions, and few chances seemed forthcoming. Just after the hour mark, veteran Kavanagh seized on an Owuzusi clearance and with nobody coming out to close him down, thundered in a shot from 25 yards to give Carlisle back the lead. This led to Parky making three on-field changes, with a tiring Owuzusi, a disappointing Izale McLeod, and Jose Semedo sacrificed for Jonjo Shelvey, Dave Mooney, and Grant Basey. Kelly Youga switched to right-back to accommodate Basey, and the Welshman seemed to have most passion driving forward and getting in several dangerous crosses. Dailly then came close to being sent off when he fouled again, before Therry Racon forced a good save. It was all Charlton pressure now, but a break would not come as Mooney headed wide, Shelvey had a free-kick saved, then Mooney had another header saved. The game was settled when, eight minutes from time, Kavanagh strode forward again and, once more unchallenged, stroked the ball into the top corner of the Charlton net to make it 3-1. For Charlton to take just one point from their last two away games is not good enough, and the real danger now is that all the good work over the opening weeks of the season is going to waste. It seems obvious to many that Deon Burton (despite his penalty goal yesterday) is a shadow of his former self and that delaying his hernia operation (as Charlton have) is doing the side more harm than good. With Clinton McKenzie close to fitness, and with Mooney chomping to get a start, Parky has enough options to accommodate the loss of our top scorer for three weeks, especially as one game during that time is the cup tie at Northwich Victoria next weekend. The break from league action at least gives Charlton the chance to recover and take stock, while the next two games (in the FA Cup and Johnstone's Paint Trophy) should be used to give the various options a try, and to bed in the new players if possible. Not a good week for the manager, even after putting pen to paper, and not a good week for Charlton (or Zoe Lucker! ).